A friend who attended The Patient Path’s uterine cancer talk in January 2017 was inspired to consult a gynecologist, something she hadn’t done in five years, about a mysterious abdominal pain. I’ll tell you at the outset that Diana’s story has a happy ending. But she did experience a uterine cancer scare, which has a personal twist you’ll want to read about. Diana’s message for you is that she is very glad she finally saw a gynecologist because now she “knows” she has “no” uterine cancer—and this has given her much peace of mind. Note: This is not the same friend whose breast cancer story I told on this site. Both ladies just happen to have similar names. An update on Diane, who is doing very well since her breast reconstruction surgery, will be coming in the near future. Recently, I had lunch with my friend Diana, and she recapped for me the story of her recent uterine cancer scare. Thankfully, she does not have the disease. But she did live through a few weeks of turmoil before she knew that for sure. At the end of my 45-minute presentation, which included a statistical overview of cancer occurrence in the US, risk factors and symptoms of uterine cancer, and a description of my personal uterine cancer history, including genetic testing, we had about 15 minutes of free discussion time. Diana, who is in her mid-sixties and recently moved to this part of New Jersey when she married her second husband, had a conversation with another of my friends, Pat, confessing she hadn’t been to a gynecologist in about five years. Well, Pat wasn’t about to let Diana get away with this and gave her the name of her gynecologist. Rewind to about 15 years ago: In the early 2000s, Diana, then about 50, went into menopause and noticed very heavy bleeding. At that time, she was seeing a gynecologist only about every five years because she was generally healthy and had no symptoms. A birth control pill user, she had no children. Alarmed by the bleeding, however, she immediately consulted a gynecologist , who did an endometrial biopsy that was considered “suspicious.” A pelvic and transvaginal ultrasound showed a mass, and Diana was scheduled for a dilatation and curettage (D&C)—scraping of the uterine lining, or endometrium. At the time of the procedure, the doctor visualized what looked like a fibroid tumor. However, because of its position, it couldn’t be removed without abdominal surgery. The doctor was confident it was a fibroid, which is a benign, non-threatening mass, and advised leaving it in place as long as Diana didn’t develop other symptoms. Diana referred to this as a “bad experience,” especially because she had to live with a known mass that the doctor decided not to treat. Then abruptly, Diana’s bleeding stopped, and she was in full menopause. She had no symptoms—not even a hot flash! Because she was otherwise very healthy, and was dissatisfied with having had to go through a procedure that left her with a fibroid, she had gynecologic checkups infrequently over the ensuing years. In an ironic, sad twist, Diana’s husband’s first wife, Donna, died of uterine cancer in 2014 at the age of 71. It’s easy to imagine the shock and fear he must have been going through during Diana’s own uterine cancer scare, as well as the relief he must be feeling knowing his second wife is uterine cancer free. At age 68, Donna noticed vaginal bleeding—the most common symptom of uterine cancer at this stage of life, although excessive bleeding and even uterine cancer can also occur in younger women. She underwent a total hysterectomy, vaginal radiation (brachytherapy), and chemotherapy and seemed to have recovered. However, three years later the cancer metastasized to her brain, and she died shortly thereafter. I do not have any further information, such as how long Donna may have waited before seeking treatment, the stage or grade of her original tumor, or other factors. Fast-forward to last year: In 2016, Diana started noticing occasional sharp pains in the area of her uterus that felt like very bad cramps. “I’ve never experienced childbirth, but I thought this must be what a contraction felt like. 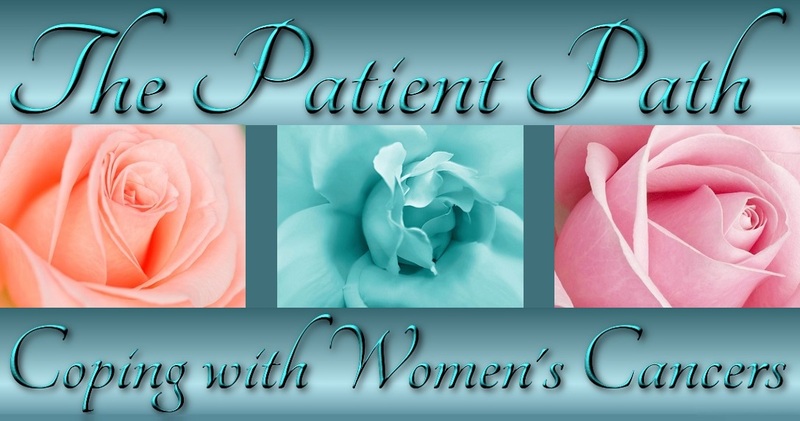 The pain lasted only about 10 seconds, but it took my breath away.” Uterine or abdominal pain is often another symptom of uterine cancer. About three months after she attended my talk in January, Diana did call Pat’s gynecologist. After having to wait a bit before getting an appointment, she finally saw her new doctor on May 3, 2017. The pelvic exam was normal, and the doctor gave her a prescription for Premarin cream to use twice a week for vaginal dryness. Although Diana had reported her history of sharp twinges of pain, the doctor insisted she was “fine.” However, Diana persisted in asking about the pain because it was becoming more regular, and the doctor finally scheduled her for an ultrasound the following week. Not long after this visit, Diana felt the pain again and was glad she would be having another test to try to determine its cause. Note: When I saw my gynecologic oncologist for my three-year post-hysterectomy visit last December, I told him about my planned talk at the library the following month. To my relief and delight, he supported my efforts, and he passed on two pieces of advice to share: (1) any woman, regardless of age, who has abnormal gynecologic symptoms—particularly unusual vaginal bleeding or pain—should undergo an endometrial biopsy; and (2) if the symptoms are very worrisome, she should consult a gynecologic oncologist for a second opinion as soon as possible after seeing her regular gynecologist. After the procedure, which Diana described as “a piece of cake,” she had another long wait for the pathology results—and more anxiety. Finally, on June 23, she got her report: “… fragment of endocervical polyp … fragments of benign endometrial polyp.” The doctor told Diana that she didn’t have a completely formed polyp. But she also said that she saw the old fibroid tumor during the hysteroscopy, reiterating what Diana had been told before—that the fibroid was in a location that would require hospitalization and abdominal surgery to remove. Because her endometrium was not thickened and the pathology report showed no evidence of uterine cancer, Diana was (again) pronounced “fine.” Her doctor put her back on Premarin to relieve her vaginal dryness and atrophy, which are normal symptoms in a menopausal woman. Note: Use of estrogen-only products is not recommended for any woman at risk for or with a history of uterine cancer. I have addressed this issue elsewhere on this site and will be revisiting the topic when I update the post on uterine cancer risk factors and symptoms. However, Diana still had no answers about her mysterious on-again/off-again sharp abdominal pain. Her doctor thought it unlikely that the fibroid was causing it and advised Diana to see a gastroenterologist if the pain returned. Seeing a gastroenterologist seems like a good idea, given Diana’s unexplained pain in the lower abdomen and also her history. In 2005, she had an appendectomy followed by peritonitis. At that time, she also had a colonoscopy and removal of a benign polyp. Over the next nine or ten years, she developed symptoms of gastroesophageal reflux disease (GERD). In 2014, she had a second colonoscopy and removal of another benign polyp. Then her GERD symptoms worsened, and she had an upper endoscopy in 2016, which confirmed the reflux disease and for which she takes Nexium (as do I). Note: In a future post, I will address the topic of GERD, something I also suffer from, and the recent studies linking treatment with proton pump inhibitors (PPIs)—such as Nexium, Prevacid, and Prilosec—with health problems, including kidney damage, bone fractures, and dementia, as well as with early death. So Diana is watchful of her abdominal pain, which occurs only rarely, but she says feels like “a lightning bolt that goes straight through my body.” If it recurs, she will see a gastroenterologist. In the meantime, Diana is using Premarin, knowing it may pose risks in some women. Her gynecologist advised her to return for an exam in four months and will probably do another ultrasound to check the endometrium to be sure the uterine lining is not thickening, which is often an indicator of uterine (endometrial) cancer. As noted above, soon I will be updating an earlier post on uterine cancer risk factors and symptoms. Although Diana is in the clear, she does have a few risk factors, including never having borne a child, carrying some extra weight around her midsection, and having a tendency to develop polyps in her cervical and uterine areas, as well as in her colon. (Note that colon cancer and uterine cancer can be linked genetically. I will discuss this in a future post.) She also has cancer in her family, but not gynecologic or colon. If she is careful about monitoring herself for symptoms and keeps her exam appointments, however, Diana has every reason to believe she will have a healthy, active life. I’m sure Diana’s husband, who lost his first wife to uterine cancer, agrees. And as an almost four-year uterine cancer survivor, so do I. Click the image to see more on my story. At present, no screening test is available to detect uterine cancer, so women need to be their own healthcare guardians and advocates. If you have any abnormal gynecologic symptoms, especially excessive bleeding or unusual pain, please see your doctor immediately. Unfortunately, although uterine cancer is diagnosed in about 60,000 US women per year and takes the lives of about 11,000 of them, mostly because of obesity, this disease is still not a topic that gynecologists readily discuss with their patients. They give us Pap tests to look for cervical cancer and send us for mammograms to detect breast cancer. Yet a gap still exists in our healthcare system about informing us of the fourth most common cancer and the most commonly diagnosed gynecologic cancer in US women. And more and more younger women are getting uterine cancer and, tragically, may never bear children. As yet, no screening test has been developed to detect uterine cancer. So be strong for yourself. And be strong for your sisters. Learn and spread the word about uterine cancer: to “know” it is to “say no!” to it. Please visit this site again soon for more information on uterine cancer risk factors and symptoms. Help stop this disease from killing the organ that gives us life. Also see Resources for Coping with Uterine Cancer (continually updated).